Duration : 7 Nights, 8 Days . Arrival to Fes Airport where you will be greeted and transferred to your hotel or riad. This morning you will discover the 9th century section of the Medina ? Fes Elbali located on either side of Fes river: The Andalusian town where you will visit the 14th century Koranic college and the Karawiin Mosque and the animated souks, artisan quarters and squares. After lunch at the Jewish club of Fes where you will enjoy Moroccan Jewish specialties, you will visit the neighboring synagogue. This afternoon, you will visit the Mellah: the Jewish quarter built in the 14th century and largely populated in the late 15th century by the Jews expelled from Spain during the inquisition. Fes? 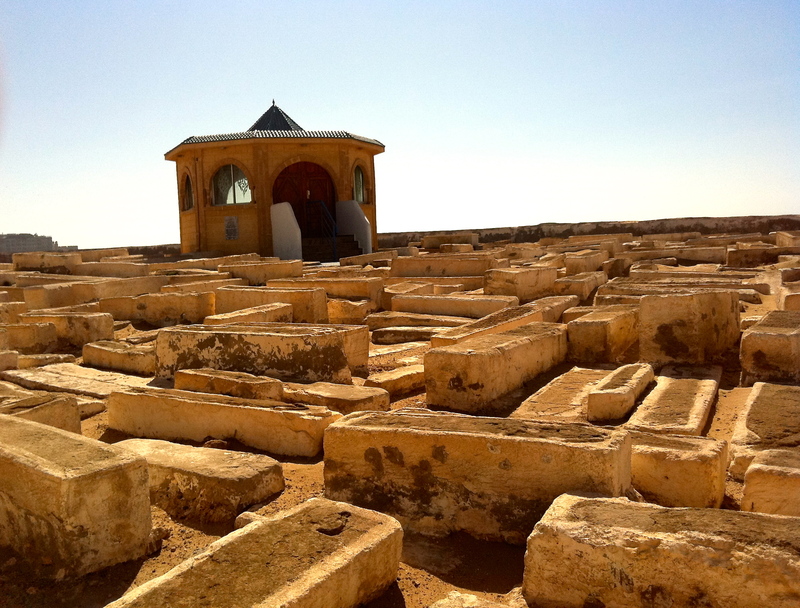 historic cemetery where some of the graves are over 1600 years old, houses the tombs of Fes? Rabbi?s, judges and Tzaddikim. Later, stroll through in the lively streets of the Mellah and admire the beautiful Moorish architecture brought from southern Spain. You will stop at the 17th century Ibn Danan Synagogue restored recently by the world jewish congress. This morning, you will drive to Volubilis, the most important Roman archeological site in Morocco discovered in the early 20th century and the sight of exquisite mosaics and architecture. A tombstone with Hebrew inscriptions was found there and is now housed at the archeological museum in Rabat. Continue to Meknes, an other of the Imperial cities built around 1672 by the Notorious Sultan Moulay Ismail and which was once inhabited by a large Jewish community. Yo will see the magnificent Bab El Mansour, the imposing royal granaries and the royal stables where thousands of horses were kept. A pool covering almost ten acres used to irrigate the expansive gardens of the royal palace. Visit the jewish quarter and it?s old cemetery facing the former Talmud-Thora school. After lunch, drive to Rabat where you will dine with members of the Jewish community. After breakfast, discover Rabat, the current capital of Morocco, commencing with the 19th century royal palace, The Chellah archeological site with it?s Merinid necropolis dating to the 14th century and the 1st century ruins of Roman Sala Colonia. From there, visit the 12th century Kasbah of the Oudatyas with it?s beautiful Moorish gardens and architecture and it?s views over the Bouregreg estuary and the coast from where the Sallee Rovers set out to dominate and terrorise shipping along the Atlantic coast. Spend some time in the National Archeological Museum of Morocco, where you will discover archeological treasures of Morocco including a tombstone with Hebrew inscriptions discovered in Volubilis. Before leaving Rabat, stop at the magnificent Mausoleum of late King Mohammed the 5th who has a special place in the heart of every Jew of Moroccan origin. During the second world war occupation, Hitler demanded that King Mohammed the 5th turn over all Moroccan Jews. The king replied: we have no Jews, we have Moroccans, and successfully rebuffed Hitler. After lunch, drive to Casablanca. Visit the Jewish museum of Casablanca recently set up by the Foudation of Moroccan -Jewish cultural Heritage. Here, you will discover the rich history of the Jewish civilisation in Morocco. A lecture will be given by Mr Levy, Director of the museum. Later, you will visit the Shrine of Raddi Eliahou, and tour the city of Casablanca with it?s Art-Deco architecture, stopping at some of it?s most important Synagogues and meeting Casablanca Rabbis. Dinner tonight at the Cercle of the ewish community. After breakfast, drive to Marrakech and check in to your hotel. The rest of the morning is free. In the afternoon, stroll through the 16th century Jewish quarter, the Mellah and visit the Synagogues of Rabbi Hanania Hacohen and Rabbi Mordekhai Ben Attar/ End your tour of Marrakech with the colourful and animated souks, then Jamaa El Fna square with its story tellers, fire eaters, acrobats, jugglers, fortune tellers, snake charmers, dancers and performers of every kind. Fantasia dinner show. Today, you will take a trip to the shrines of some of the most important rabbis in the berber region of Marrakech. First, visit the sanctuary of Rabbi Shlomo Ben Elhench located in a spectacular valley south of Marrakech and meet the Jewish family who are the guardians of this holy site. After touring the Ouricka, cross the mountains to the valley of Asni and visit the shrine of Haim Ben Diwan in the village of Ouirgane. Luch at the famous resort of La Roseraie, after which you will be driven to the village of Amzmiz to visit the shrine of Rabbi Raphael Hacohen. Return to Marrakech where you will meet the Rabbie of Marrakech in the Beth El Synaguogue. Dinner at the Kosher restaurant. At leisure, Shabbat lunch at the kosher restaurant. Transfer to Marrakech airport for departure. Explore more than 2500 year old moroccan jewish history in a land of tolerence and coexistence. 7 nights 8 days tour : 3 in Fes, 1 in Casablanca, 3 in Marrakech.